Water Isolation Trace is a Web AppBuilder app that incorporates the Utility Isolation Trace widget. To meet the demands of a rapidly expanding customer base, a Florida utility realized it needed a variety of solutions that would empower its workforce and keep its customers informed. These solutions would begin at the data level and be expanded to web and mobile applications for data entry, analysis, service outages, water quality, service availability, and capital funds expenditures. St. Johns County Utility Department (SJCUD) provides water, sanitary sewer, and reuse water services to 42,000 accounts and 100,000 residents in coastal northeast Florida. The utility’s service area is experiencing strong demand caused by increased residential construction. In 2013, SJCUD initiated the development of an Integrated Water Resources Plan (IWRP) to implement water resources solutions through 2040. IWRP indicates that under medium-growth scenarios, by 2040 the SJCUD customer base will grow by 88,000 people. Current growth combined with this anticipated growth will bring challenges that include expanding capacity, replacing infrastructure, and meeting new regulations for water reuse and availability requirements. For years the utility has embraced the capabilities of its GIS. The value of GIS lies in its ability to truly empower users at all levels. The ArcGIS platform, used by SJCUD, provides the software, tools, and templates that allow it to create applications that empower its end users. Field Observer Collector map showing the location of a missing asset collected in the field. Quality data is the lifeblood of any great application. To meet security requirements, SJCUD created geodatabases with both read/write feature access and read-only access. Read/Write feature service data is housed in an enterprise geodatabase separate from main production. For read-only data, a custom Python script utilizing the ArcPy module extracts data nightly from the main utility production enterprise geodatabase. To provide data to power applications for both in-house and external customer use, the script replicates it to a publication file geodatabase on the application server, and rebuilds the water distribution geometric network. Keeping up with new and expanding utility infrastructure in an area of rapid residential construction is difficult. Locating a particular piece of infrastructure in an area with so many new streets can be just as hard, so the utility built its own custom geolocator/geocoding service using the latest and greatest street data that is based on local knowledge and sources. Geolocators for address points and streets are frequently updated and combined into a composite locator, which is published to ArcGIS Server and consumed by a multitude of web applications. Using this service ensures that staff and end users can find even the newest of addresses in the service area. Water availability and quality are paramount for the utility. To help fulfill these directives, SJCUD implemented Esri’s Utility Isolation Trace tool within two custom apps it created using Web AppBuilder for ArcGIS—Developer Edition. 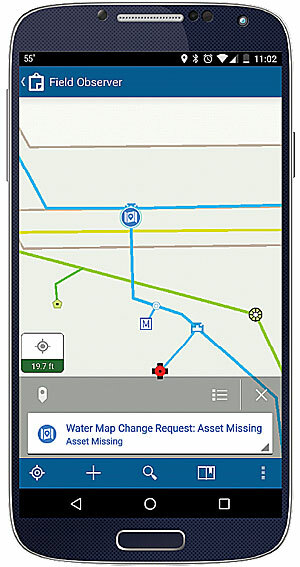 One app designed for field crews runs isolation traces during water main breaks. The other app is used by managers for further analyzing, maintaining, and disseminating isolation trace results as part of the outage information provided to the public. 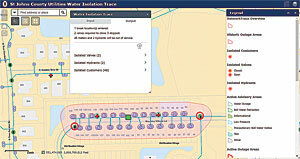 The field crew app, referred to internally as Water Isolation Trace, is a Web AppBuilder for ArcGIS app that incorporates the Utility Isolation Trace widget and is configured against the utility’s water distribution network, which resides in the publication file geodatabase, and ArcGIS Server feature services housed in the read/write enterprise geodatabase. Repair crews in the field access Water Isolation Trace over the Internet from their laptops and tablets. This allows them to conduct isolation traces while on-site and assess current conditions such as a main break. Isolation trace results can be saved to the enterprise geodatabase, which reduces the coordination with staff back at the office and saves time. Other applications can also consume isolation trace data and results. Powering these apps requires accurate and trustworthy data. To ensure data quality, the utility created an app that is a hybrid of two Esri solutions: Map Notes and Map Change Request. Both are configurations of ArcGIS that are accessed through Collector for ArcGIS on a mobile device. This app, named Field Observer, is a one-stop shop that lets utility staff members enter utility infrastructure issues and data concerns that arise as part of ground truthing while in the field. 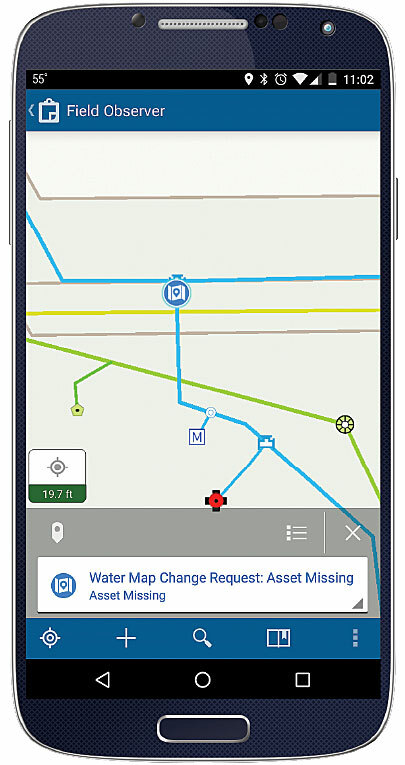 Conditions such as a paved-over valve, vegetation issue, or evidence of a leak can be captured using the app as well as sewer, water, and reuse map data change requests. The app allows utility personnel to quickly and easily identify both infrastructure and data issues and get them into the system of record where further corrective actions can be taken. Recently, Field Observer has been used to increase the accuracy of GIS data and streamline communication between field crews and the GIS team. Field crews verify the location of valves and use Field Observer to note changes to valve locations. In the past, these changes were communicated by capturing images and sending an email for each valve. Now, the information is added to the map so it is instantly visible to GIS staff. This reduces the volume of emails while increasing the flow of information. 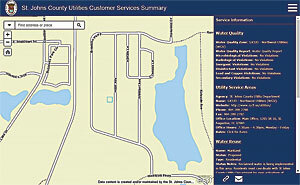 The Customer Services Summary application informs users of services available in their area and provides links to rate and water quality information. 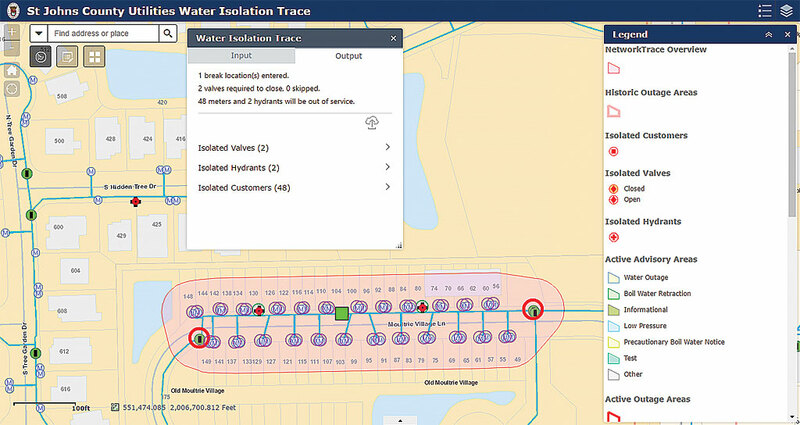 Advisory Manager, the other Web AppBuilder for ArcGIS app developed for managerial applications, is a clone of the Water Isolation Trace app. It incorporates the Web AppBuilder for ArcGIS Edit widget and two custom widgets (Create Code Red tool and Extract Code Red tool) that work with the utility’s Code Red system, which is used to notify customers of outages and other potential water supply and quality issues. The Create Code Red tool takes an outage area polygon from an isolation trace run and intersects it with parcel polygons to prepare a notification area. The Extract Code Red tool is a custom Web AppBuilder for ArcGIS widget powered by a slightly modified version of the Extract Data script tool from the Server Tools Toolbox. This tool allows a user to select a Code Red polygon to export from Advisory Manager as a shapefile that can be imported into the Code Red system. Code Red accepts the shapefile as an input, gathers all registered users in that area, and sends out notifications regarding the issue. This streamlines the customer notification process. 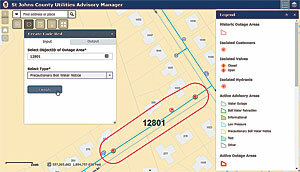 Advisory Manager is also used to manage the status of drinking water advisories. Following a recent water main break, SJCUD’s environmental manager quickly created a Boil Water Notice for the affected customers and pushed that information out to the public. Once the lab tests determined that the water was safe for consumption, it was just as easy to issue a retraction of the Boil Water Notice. The process is so easy that in a recent case, the retraction was issued using Advisory Manager on a mobile phone from a tennis court. This anytime/anywhere application makes the flow of information from the utility to its customers smooth and virtually instantaneous. Advisory Manager application with Create Code Red tool set up to be run. To notify customers of water quantity and/or quality issues, the ArcGIS for Water Utilities Drinking Water Advisory template was deployed. Boil water notices, boil water notice retractions, water outages, and low water pressure notices created through the Create Code Red tool are displayed here as Drinking Water Alerts and Advisories. The Alerts and Advisories layer is updated from within the Advisory Manager application. To inform customers of services available in their area, the ArcGIS Information Lookup configurable web application was implemented as the Customer Services Summary application. Customers can click the map or search by address using the custom in-house geocoding service to get a list of services, contacts, and other information for that location such as water quality reports, irrigation regulations, and utility rates. Keeping customers up-to-date on future projects and expenditures is important to any utility. To help with this, SJCUD created and Esri Story Maps app using the Story Map Tour template, customized with a tabbed layout for viewing reuse, sewer, and water capital improvement projects by category. The utility had used CSV files and hosted feature services as data sources for its story maps in the past but wanted to be able to drive this story map dynamically using a feature service sourced to its enterprise geodatabase. With this setup, the utility’s GIS staff can add content to the story map simply by adding new features and/or changing a status in the data. There is no need to touch the application or any items in its ArcGIS Online back end. With this story map, the public can learn where capital investments are being made in the county and what these investments can do for them. 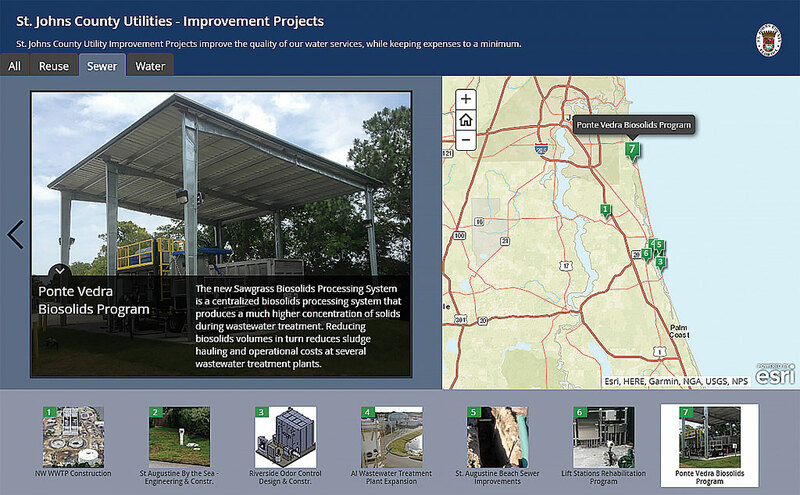 An internal-only ArcGIS Online web application was also created to keep utility staff informed of current and future capital improvement projects. Although a simple viewer, this internal app shows all capital improvement projects and provides full access to data attributes and full-resolution photographs. 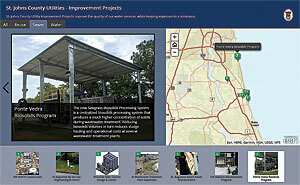 The capital improvement projects story map shows a variety of ongoing utility sewer projects. After Hurricane Matthew hit the area in early October 2016, the utility was able to quickly deploy applications to aid in response and recovery. The Damage Assessment solution, a configuration for Collector for ArcGIS and Operations Dashboard for ArcGIS, was used to quickly assess damage to approximately 360 lift stations. Teams equipped with tablets began assessments. They completed the project ahead of schedule within a matter of days. Lift station conditions were quickly recorded, including photographs of any damage. Information gathered with this tool was used for documentation for insurance evaluation and for Federal Emergency Management Agency (FEMA) reimbursement. Public water advisories were posted to the 100,000 customers without water. Sanitary sewer overflows were located, the public notified of their locations, and the sites inspected for water quality compliance. In the aftermath of that natural disaster, GIS aided recovery efforts. The hurricane response and recovery tasks were tracked and reported using Cityworks and ArcGIS Server. To illustrate the volume of work completed during and after the hurricane, SJCUD created a web map app that demonstrated how rapidly the utility addressed and resolved issues in response to the emergency using a time line. 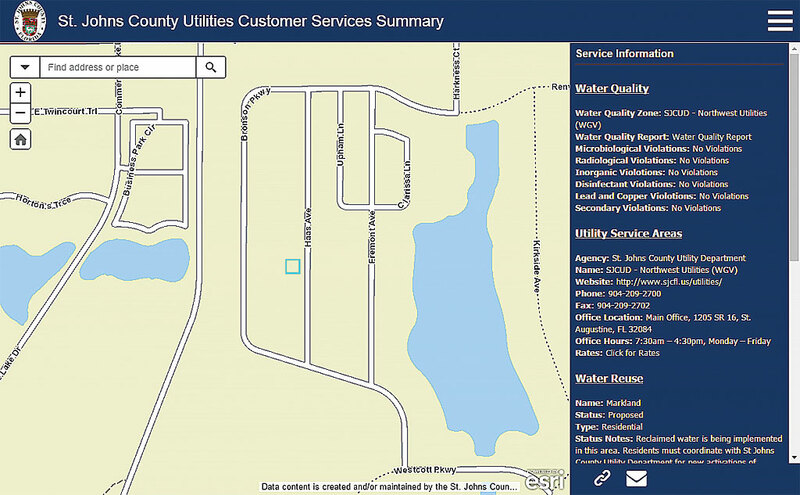 St. Johns County Utility Department uses the ArcGIS platform to enable its workforce and empower its customers with accurate and current data on the state of water, sanitary sewer, and reuse water services. By putting the right tools, maps, and apps into the hands of its field workforce, the utility can provide quality data, up-to-date information, and timely and accurate notifications to its customers despite the challenges of rapid growth in its service area. 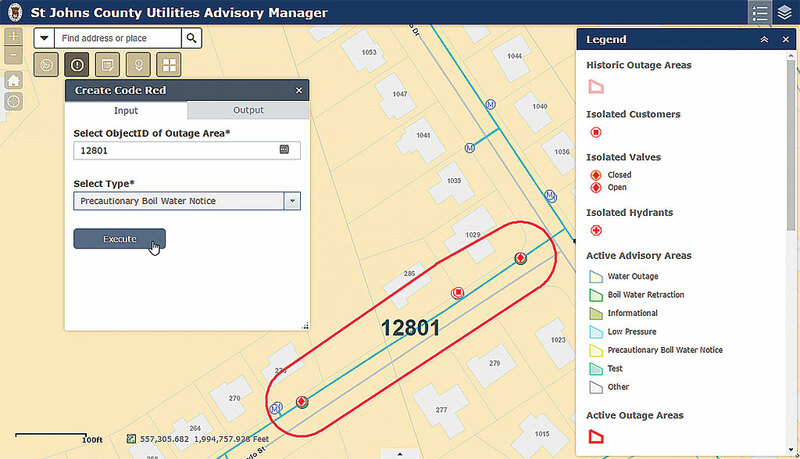 Although the utility has a mature GIS shop, it continues to discover new ways to utilize GIS and the ArcGIS platform to help gain efficiencies and save money. For more information, contact Chad Cooper at chad.cooper@gisinc.com. The author thanks Tom Tibbitts, Karri Thomas, and Bryan Bommersbach at St. Johns County Utility Department for partnering with GISinc and helping with this article. Michael Parma and Chris Blinn of GISinc were both instrumental in workflows and applications implemented for the utility by GISinc. 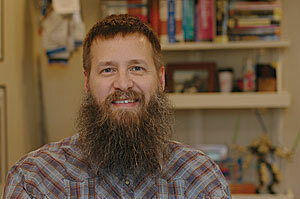 Chad Cooper has worked in the geospatial industry over the last 15 years as a technician, analyst, and developer for state and local governments, oil and gas companies, and academia. For the last three years, Cooper has worked as a solutions engineer, consulting on the State and Local Government team with GISinc. At work, he couldn’t be happier spending the day writing Python and helping clients such as St. Johns County Utility Department get the most out of their data through the use of the ArcGIS platform. At home, he enjoys hanging out with his gorgeous wife of 12 years and their three wonderful children. They enjoy hiking, fishing, and doing nothing on a nice beach.